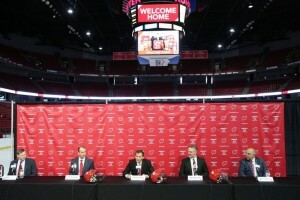 On Wed, Mar 30, the UW Athletic Department introduced the new Men’s Hockey coaching staff which has been dubbed the “Dream Team” as it is comprised of Tony Granato, Don Granato and Mark Osiecki. That is the tagline the Athletic Dept has been using to announce the hiring of the Men’s Hockey team’s “Dream Team” of coaches. Yes, they can use Dream Team because the coup that Barry Alvarez pulled off it incredible. Hiring one of these guys would have been great, but to get all 3, on one coaching staff, AMAZING. And the “welcome home?” All former Badger players. Cha-Ching! So the Athletic Department put together a promo website to tout the hiring of the Dream Team. Bios of each of the new coaches covering their stats and accomplishments at every level, tons of video clips and just a first class marketing job all the way around. All three have experience at Wisconsin, coaching in the minors, National Development Team and of course the NHL. Their credentials are nothing short of amazing. They have video clips of existing and former Badger Players talking about just how special this hire is. The list is incredible starting with current players Cameron Hughes, Luke Kunin and Grant Besse. Then it moves to former players Adam Burish, Blake Geoffrion and Joe Pavelski. And for good measure you can view players that played for Tony Granato in the pros like Sidney Crosby. This is crazy. Even the local press are jumping on the bandwagon here. And I say “jumping on” because after the last couple of seasons they were not exactly the biggest fans. Fan attendance and overall support for Badger Hockey plummeted after a disastrous 12-45-13 record the past two seasons. This poor showing forced the hand of Athletic Director Barry Alvarez who dismissed coach Mike Eaves. Eaves’ teams won an NCAA title in 2006 and played for another one in 2010, then went into decline. It should be noted that UW’s recruiting was never the same after Osiecki, Eaves’ top recruiter, left following the 2010 season. I’ve been a season ticket holder for 25 years. I loved Mike Eaves as a hire and as a coach. When he was dismissed I penned a column thanking him for what he’d contributed to Badger Hockey. I still stand by what I wrote, but I also believe it was time for a change. I believe in the new coaching staff already, but they’ve got some work to do. They’ve got to nail down some existing players (Luke Kunin in particular) and then hit the recruiting trail. They’ve got to install their system and then get the players’ buy-in. Yes, this is a very exciting time, but having a great coaching staff does not insure a national title. As I said… there is work to be done. I don’t think as a fan you could be more excited right now. This is an unbelievable time to be a badger hockey fan.